Hi friends, I wanted to post an idea for a quick, delicious and inexpensive holiday gift. This is the easiest (I promise) and fastest (still promising) fudge recipe that you will ever make. It only takes about 5 minutes and is really yummy. This fudge also makes sweet little gifts when poured into holiday shaped cookie cutters and wrapped up with some ribbon. It's fudge AND a cookie cutter...it's the gift that keeps on giving. Who wouldn't want that? Line a baking sheet with parchment paper. Spray the inside of the cookie cutters with a non-stick cooking spray. Place on parchment paper & set aside. Over low-medium heat, melt the chocolate & butterscotch chips. Add the Sweetened Condensed Milk & Vanilla. Remove from heat & add Cranberries & Almonds. Pour into cookie cutters and refrigerate for 30 minutes. 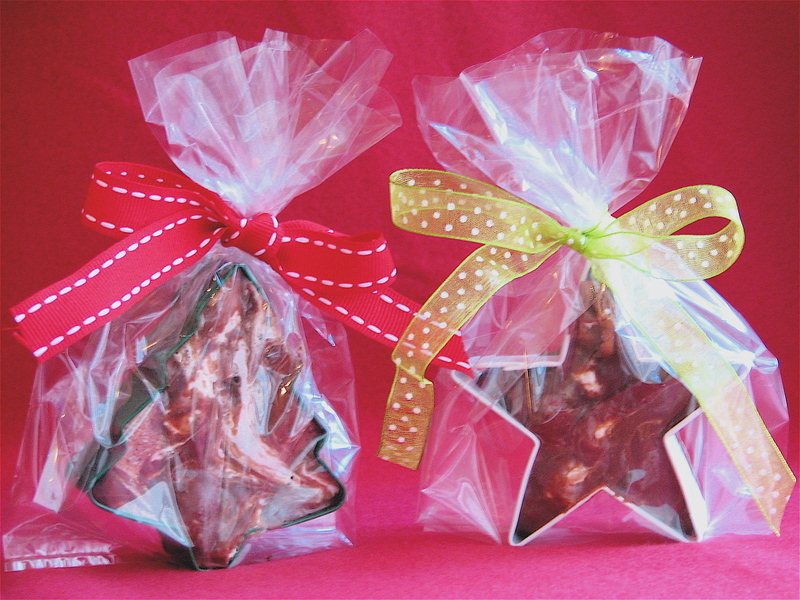 Wrap in a cellophane bag & tie with ribbon.